Please don’t let that title scare you off. That is a beautiful and profound word. Christ’s death turns away the wrath of God. The apostle Paul said Christ is our propitiation. He is a propitiatory sacrifice. It refers to what Christ did on our behalf before God. We are “justified as a gift by His grace through the redemption, which is in Christ Jesus; whom God displayed publicly as a propitiation in His blood through faith” (Romans 3:24-25). God gave His Son as the means of the propitiation, “and He Himself is the propitiation for our sins; and not for ours only, but also for those of the whole world” (1 John 2:2). “In this is love, not that we loved God, but that He loved us and sent His Son to be the propitiation for our sins” (1 John 4:10). A. T. Robertson said, “God could not let sin go as if a mere slip. God demanded the atonement and provided it.” It was “by the grace of God He might taste death for everyone” (Heb. 2:9). The word “propitiate” in its classical form was used of the act of appeasing the Greek gods by a sacrifice, of rendering them favorable toward the worshipper. The sacrifice was offered by the pagan worshiper to buy off the anger of the god and buy his love. Note very carefully that this idea is not brought over into the New Testament. The LORD God does not need to be appeased nor is His love for sale. In the New Testament it refers to the act of getting rid of sin which has come between God and man. The word hilasterion is used in the Greek translation of Leviticus 16:14 to refer to the golden cover on top of the Ark of the Covenant. In the Ark, below this lid, were placed the tablets of stone upon which were written the Ten Commandments, which Israel had violated. On the Day of Atonement before the Ark stood the High Priest representing the people who had sinned. When the sacrificial blood is sprinkled on this cover, it ceases to be a place of judgment and becomes a place of mercy. The blood comes between the violated law and the violators, the people. The blood of Jesus satisfies the just requirements of God’s holy law which mankind broke, pays the penalty for man, and thus removes that which had separated between a holy God and sinful man, sin, its guilt and penalty. This is far removed from the pagan idea of propitiation. Jesus Christ is God’s High Priest who was both the Mercy Seat and the Sacrifice, which transforms the former from a judgment seat to one where mercy is offered a sinner on the basis of justice satisfied. The LORD God set forth His Son, the Lord Jesus, as the One who would be the satisfaction for our sins. Because God is satisfied with the payment of the sin debt, His wrath is turned aside, away from the believing sinner. Christ absorbed the wrath of God on our behalf. He bore our punishment as our substitute. When God looked down upon the sacrifice He judged man guilty, the payment was paid in full, and in His righteousness could therefore acquit the believing sinner who put His trust in the Lamb of God. That mercy seat is the place were God met man in His grace since the sacrifice turned away the wrath of God because His righteousness was satisfied. The guilty sinner is spared because of the death of Christ in our place. When God looks down upon the believing sinner He sees not our sins and guilt, but the blood of Jesus. He is our expiatory sacrifice that satisfied the righteousness of God. His death paid our debt in full and a holy God was satisfied. All of the lambs in the sacrifices in the Old Testament pointed to God’s perfect Lamb who would wholly remove our death penalty. How do we know this is all true? We know we can trust God because a holy and righteous God tore the veil in the temple from top to the bottom. The moment Christ died it was like God the Father reached in and took hold of His outer garment and tore it from the top to the bottom in His mourning for His only Son. God tore the veil in two to open the way into His presence for all who believe on His Son as their sinless sacrifice who died as their propitiation. Bloody sacrifices came to an end in the temple because the death of Christ alone met all the holy demands of a thrice-holy God. 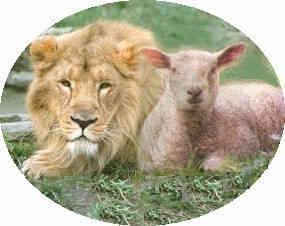 Have you placed your trust in God’s Lamb?